Wellness in the Schools (WITS) is a program that gets into the mix. When I think of WITS, I think of their Cook in Residence at PS 126, Robin Hom, pushing kids in the lunch line to eat chicken cacciatore and roasted broccoli rather than take a peanut butter and jelly sandwich, or Chef Bill Telepan nearly inside a steam kettle checking out the contents, or Nancy Easton across the table from a principal assessing the progress of the program in their school. I think of everyone hard at work, because that’s been my experience with WITS. Well, every once and a while a nonprofit has to go from behind the scenes and into the spotlight to raise the money necessary to keep things moving forward. Last night was that time for WITS at their annual fundraiser. 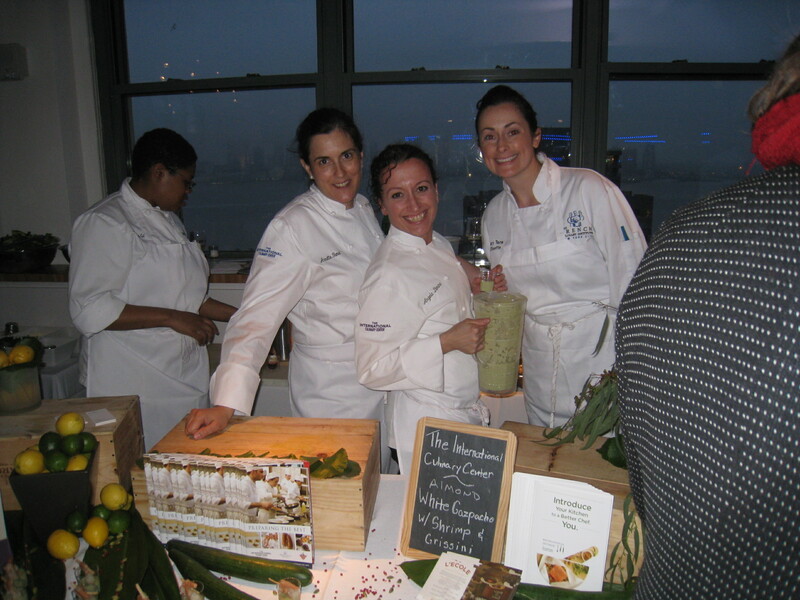 The International Culinary Center (ICC) was happy to support the event with Chefs Annette Tomei, Angela Dimino, Tara O’Keeffe, and student Darelle Green preparing and serving 500 plus Almond White Gazpacho Shooters with Shrimp and Grissini to a hungry crowd. The ICC is both a financial sponsor and restaurant affiliate of WITS and we’re proud to be a part of their work behind the scenes and under the spotlight. Though final tallies aren’t in, the night definitely looked like a success; but if there’s one truth in nonprofits, it’s that more help is always needed. To find out more about how you can help WITS, check out www.wellnessintheschools.org. Of course, the student is hard at work in the background. We’re excited to be involved in the development of another non-profit, The Cooking Room. The Cooking Room is a food literacy program for kids being put together by a group of parents and faculty at PS 3 in Greenwich Village. When you’re putting together a program like this, it always helps when one of those parents is a world-class chef like Zak Pelaccio. The Cooking Room uses some of the same fundamentals used to train cooks to come into a professional kitchen. You train them to taste (bitter, sour, sweet, salty, and umami). In the cooking room, you use real, and sometimes unfamiliar, ingredients—puntarella and tamarind come to mind.You also train in basic culinary technique (peeling, chopping, stock making, baking, etc.). Essentially, you train them to look at real, whole foods as something accessible to cook and eat. And it’s amazing what they’ll eat when they prepare it. In addition to assisting with curriculum and volunteers, occasionally, I get to step in for Zak when he’s taken away by business. 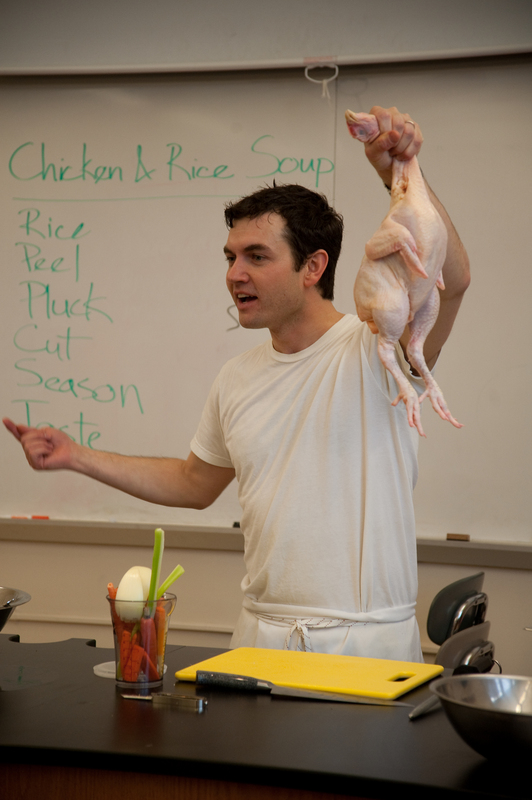 Following are some shots from the Chicken and Rice Soup lesson. Wellness in the Schools (WITS) is non-profit that has planted itself directly in the battlefield of the current food fight in schools—cafeterias. 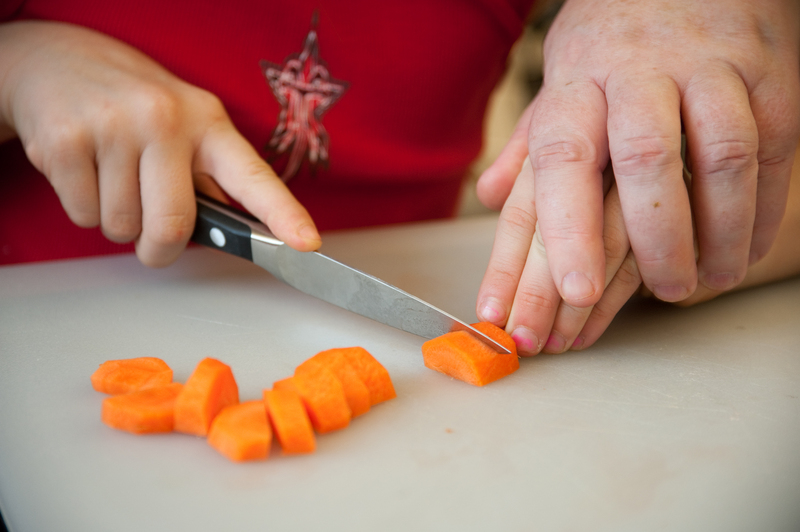 The organization brings a WITS Cook in Residence to participating schools to work with cafeteria staff to provide additional healthy and from scratch options for kids and bridge the distance between lunchroom and classroom with in-class food lessons. We’re a sponsor and restaurant partner of WITS. Additionally, several WITS Cooks in Residence are graduates of The French Culinary Institute’s Classic Culinary Arts program, including Robin Hom at our sponsored school PS 126. We’re on the ground with Robin and the cafeteria team working toward innovative solutions to challenges that cafeteria staffs face. 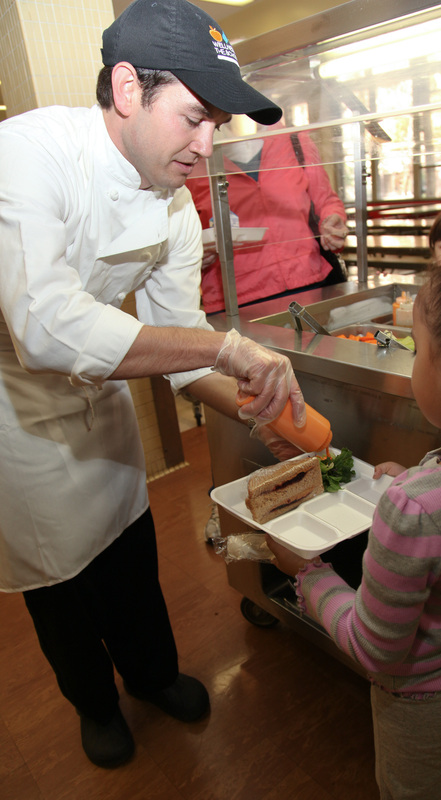 Follow our efforts in and out of the cafeteria at PS 126 on The Lunch Box. Check out photos from a recent lunch day at PS 126 on our Flickr page.